Description CARFAX 1-Owner, GREAT MILES 70,558! WAS $13,995, EPA 29 MPG Hwy/20 MPG City!, $500 below NADA Retail! Heated Leather Seats, All Wheel Drive, Alloy Wheels, Back-Up Camera, Remote Engine Start, Premium Sound System, Tow Hitch SEE MORE! Leather Seats, Heated Driver Seat, Back-Up Camera, Premium Sound System, Remote Engine Start, Heated Seats, Heated Leather Seats. All Wheel Drive, Onboard Communications System, Aluminum Wheels, Privacy Glass, Keyless Entry. LIFTGATE, REAR POWER PROGRAMMABLE WITH FIXED GLASS, TRAILERING EQUIPMENT includes Class II 1-1/4" receiver hitch and 4-wire connection. (Maximum trailer weight of 1500 lbs. (680 kg) with (LEA) 2.4L I-4 SIDI engine and maximum trailer weight of 3500 lbs (1588 kg) with (LFW) 3.0L V6 SIDI engine. ), CARGO PACKAGE includes (D42) rear cargo cover, (AP9) cargo convenience net, (V1K) luggage crossbars, ENGINE, 2.4L DOHC 4-CYLINDER SIDI (SPARK IGNITION DIRECT INJECTION) with VVT (Variable Valve Timing) (182 hp [135.7 kW] @ 6700 rpm, 172 lb-ft [232.2 N-m] @ 4900 rpm) (STD), AUDIO SYSTEM, AM/FM/SIRIUSXM STEREO WITH CD PLAYER AND MP3 PLAYBACK CAPABILITY 7"-inch touch-screen Color Interface Display (CID), USB port, Radio Data System (RDS), speed compensated volume, auxiliary input jack and outside temperature display (STD), TRANSMISSION, 6-SPEED AUTOMATIC (STD). 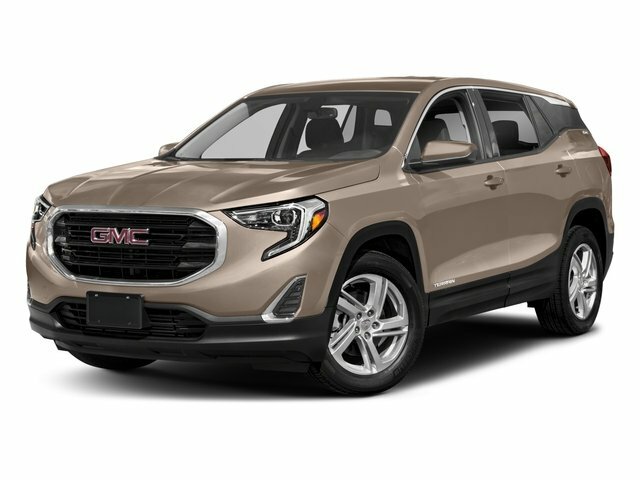 GMC SLT-1 with GOLD MIST METALLIC exterior and BROWNSTONE interior features a 4 Cylinder Engine with 182 HP at 6700 RPM*. "Solid Great Gas Mileage: 29 MPG Hwy. Reduced from $13,995. This Terrain is priced $500 below NADA Retail.